If you've been doing the paid survey thing for a while, you're probably pretty familiar with the dreaded “screen-out” scenario. This is when you get an invitation to do a survey, go through the pre-approval process which can sometimes take 10 to 15 minutes, only to find out that you aren't a good candidate for the survey and have wasted your time with no compensation. It's frustrating, and some of the best paying survey sites out there don't pay you for your time if you don't qualify for the actual survey. Many people continue to use these sites and they should! It's always worth a try. But if you're looking for some sites that either send you pre-qualified surveys or at least reward you for attempting to qualify, look no further. One Opinion is a newer panel that is getting great reviews from users so far. You can earn cash (Paypal or Visa debit cards) or Amazon codes for your time spent taking surveys. If you screen out of a survey, they will still give you 50 points for attempting to qualify. Read my One Opinion review or go here to sign up. Pinecone is a super popular survey site that sends you pre-qualified survey invitations to your email. These surveys are worth $3 and there are also occasional product testing opportunities. You can be paid by check or PayPal and they typically pay within a day. They are listed here because screening out is not even a thing you have to worry about with this panel. I highly recommend them! Read my Pinecone review or go here to sign up. At E-Poll you are rewarded with points for taking their various surveys. Redemption options are varied and include PayPal payments, Amazon gift cards, and a slew of gift cards for different stores like Walmart, GameStop, BestBuy, etc. The lowest amount of money you can get is $5 and it doesn't take a long time to get there. E-Poll is on this list because they generally never disqualify you from surveys they send you. This is similar to Pinecone (above). Read my E-Poll review or go here to sign up. You will earn points that you can redeem for PayPal cash, Amazon gift cards and other rewards as well as sweepstakes entries. The amount of points you earn varies depending on if you qualify for the survey or not, but you will always earn something. Most of the time if you don't qualify, you'll still get 5 points. You need 1100 points ($10) to redeem for a gift card and 1200 points to redeem for $10 in Paypal cash. Read my Global Test Market review or go here to sign up. Ipsos will reward you with Paypal cash, Visa debit cards, or gift cards to various retailers once you cash out from taking surveys. You need at least 500 points in your account to redeem for anything. 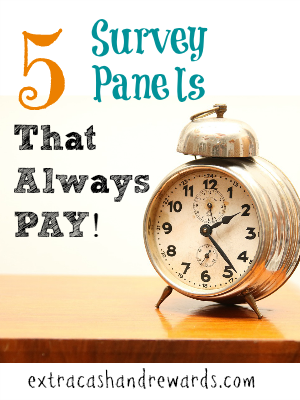 If you attempt a survey and do not qualify, Ipsos will still give you 5 points for your time spent. Read my Ipsos I-Say review or go here to sign up. MySoapBox will only reward you in gift cards — no cash — but they do have cards available from all the popular retailers you know and love. You can redeem once you have 25,000 points in your account. Also, note that the gift cards generally cost less than 25,000 points. They just make you reach this point before they'll let you start redeeming. You only have to reach the 25,000 points one time to be able to redeem from now on for anything they offer, provided you have the amount of points the gift cards cost. If you do not qualify to complete a survey, MySoapBox will still give you 10 points for your trouble. Go here to sign up for MySoapBox. I've personally been using this site for years now and I've cashed out quite a bit of money! The surveys can be worth 10 cents to several dollars depending on what type of survey it is, but you are always paid something. The minimum to cash out is $15 and you can only receive your funds through PayPal but I usually see my money within 1-2 days, though it can take 3 or 4 days occasionally. The surveys are very quick, too! Read my Paid Viewpoint review or go here to sign up. At ClearVoice, you are compensated in points, whether you qualify for the survey or not, that you can redeem for Amazon gift cards, restaurant gift cards or a Payoneer prepaid debit card that you can use anywhere that takes MasterCard. The minimum cash out is $10, and you can participate in surveys and product testing. When you join a survey panel, you might notice that most of them try to get you to fill out your profile. This is a fairly time-consuming process that involves answering preliminary survey questions about your purchasing habits, your household, your age, etc. Also, these surveys aren't usually anything you get cash or points for taking the time on. However, if you do fill out your profile questions when you join a panel, you won't screen out as often. This is because, based on your answers to these profile questions, the survey company will know in advance what surveys to send to you. If you don't fill out your profile and they don't know anything about you, they'll probably send more surveys your way, but you'll get screened out of the ones you don't qualify to complete. So fill out those profile questions if you'd like to stop disqualifying as often. Good luck! Please let us know about your experience if you've tried any of these panels. Its so supportive and helpful, thank you very much! This information is much appreciated. One meritlessly popular site that left a really bad taste in my mouth about a year ago is Swagbucks. One of the very first things I do after signing up for a survey site is complete my profile. Yet Swagbucks ignored the information, serving me junk surveys anyway and compensating me with a penny for 15-20 minutes I’d never get back. After about 3 hours, and not yet having reached 20 cents; I kicked them to the curb.